Our latest family challenge is to complete the Tupper Lake(TL) Triad. 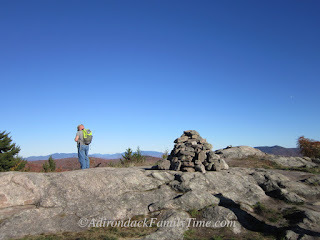 We have hiked Coney Mountain, Goodman Mountain and Mt Arab in the past, but in order to receive a climbing number, badge and decal ($5) we need to climb all three mountains after the Triad Challenge December 2015 opening date. 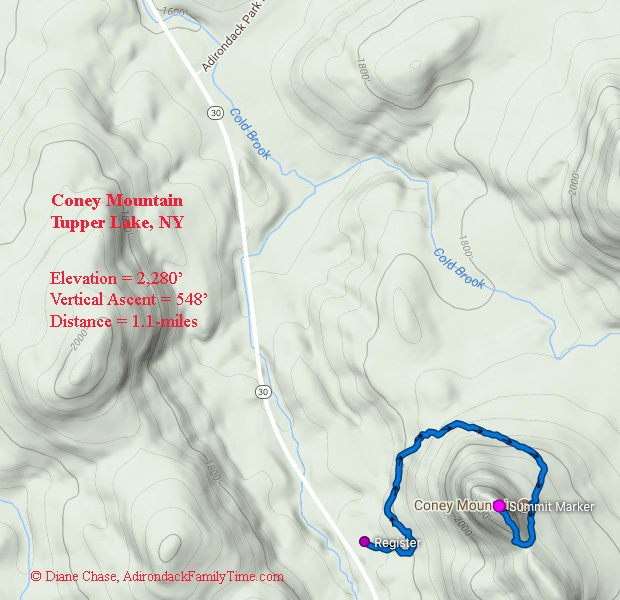 Coney Mountain has always been a family favorite, especially when we lived closer to Tupper Lake. It’s been a few years since my daughter has hiked Coney. So many years in fact, there is a different trail leading to the summit. There is a designated parking area, but we choose to join the few roadside cars and park along Rt. 30. We walk up the gravel path to the register and meet a group signing out. They enthusiastically share their experience of walking along the open crest. The trail is a gradual climb with a 548’ vertical ascent and elevation of 2,280’. We easily follow the blue trail markers leading us in a semi-circle from west to north to east. The original trail was a steeper, direct ascent that hugged the Hamilton and Franklin county lines. Redirected in 2009, this “new” trail has a gentler ascent before reaching the open rock slab. When we reach the summit there are a few other people taking in the 360° view. With plenty of space to walk along the ridge and explore, we feel like we have the top to ourselves. To the north we see Goodman Mountain (part of the TL Triad) as well as Tupper Lake. To the east we identify the Seward Range. It is a quick return trip back to our car. 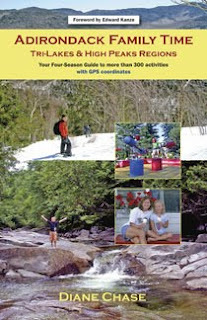 The Tupper Lake Triad can be completed in two different seasons. From the middle of December to the middle of March any of the three hikes count toward a Winter TL Triad. Any of the three mountain hiked between the middle of March to the middle of December count toward the Spring/Fall Triad. For more information and to register go to TupperLakeTriad.com. The trailhead is easily reached from Tupper Lake by driving south on Rt. 30 toward Long Lake. The Coney Mountain parking area is about 8-miles south of the Tupper Lake Public Boat Launch on Rt. 30 or 1.5-miles south of the Rt. 421/Rt. 30 junction. Parking is on the east side of the road. Enjoy! 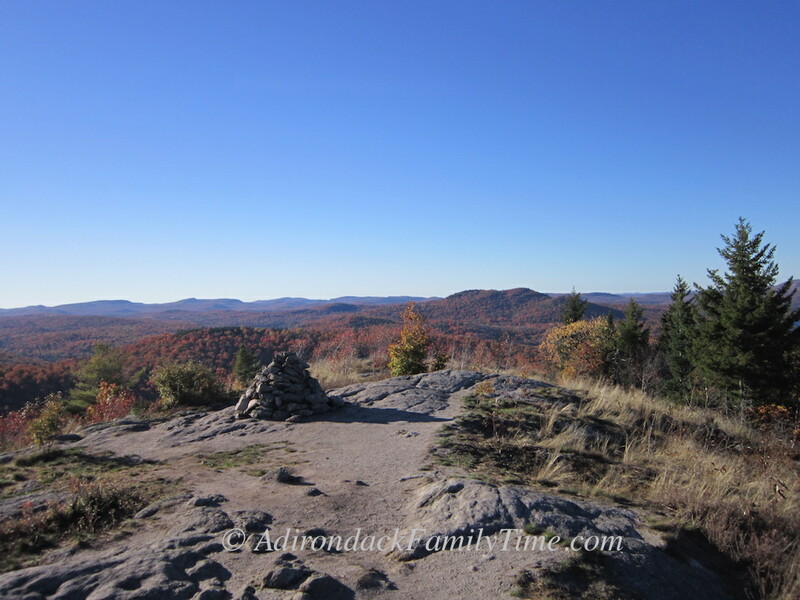 The Tupper Lake Triad can be completed in two different seasons. From the middle of December to the middle of March any of the three hikes count toward a Winter TL Triad. Any of the three mountain hiked between the middle of March to the middle of December count toward the Spring/Fall Triad.